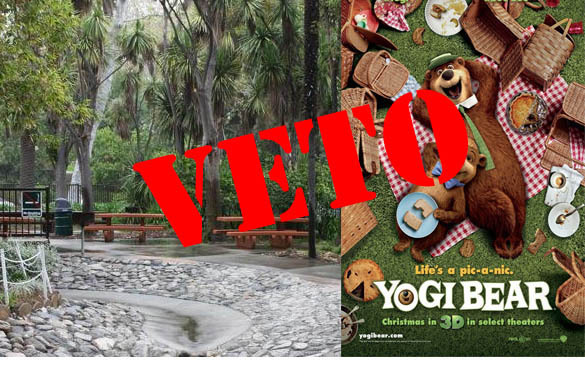 Councilman Paul Koretz has introduced a motion calling for a veto of last week’s action of the Board of Recreation and Parks Commissioners to open three city parks to a month’s worth of advertising for the upcoming Warner Bros. movie, “Yogi Bear.” In return, the city would get $46,636 for the ads in Holmby Park in Westwood, Pan Pacific Recreation Center in Hollywood, and the Sepulveda Basin Recreation Area in Encino. The motion, seconded by Councilman Tom LaBonge, refers to concerns by the City Attorney’s office that the action could jeopardize the city’s current ban on supergraphic signs and ongoing legal actions by outdoor advertising companies challenging the ban. “…the questions surrounding sponsorship and open advertising on City property, along with the role this may play in other separate but related legal matters, remains ripe,” the motion says. The council is expected to take up the motion at its next regular meeting, Tuesday, Oct. 19. As reported on this blog two days ago, the corporate sponsorship agreement with Warner Bros. Pictures was worked out by the non-profit Los Angeles Parks Foundation, which is not a city agency, although its board chairman, Barry Sanders, is also the president of the board of Recreation and Parks Commissioners. The foundation would get $57,000 from Warner Bros., then deduct installation costs and an administrative fee before turning over the remainder to the city for use on unspecified park projects. Once the board’s action became publicly known, protests were raised by residents in the area of Holmby Park, including members of the Holmby Park Advisory Board, which had no prior notice that the action was being contemplated. That group of community members that advises Recreation and Parks department on matters involving the park is expected to discuss the issue at its next meeting, Nov. 18.